Summary: The most prominent recent development among G10 majors has been the persistent weakness in the Swiss franc, where safe haven demand has evaporated after the long Brexit delay and on rising yields and the generally supportive risk-on trading environment. The Swiss franc decline has persisted with remarkable consistency recently, with the smooth appreciation in EURCHF suggesting this pair is the dominant driver. The main cause is likely the rise in global yields of the last couple of weeks and hopes that the Eurozone outlook has bottomed and is set to turn higher again. Elsewhere, the JPY is also weak on the same general risk-on complacency and rising yield backdrop. We close up shop for the FX Breakout Monitor until next Tuesday. Pairs to watch until then included USDCHF (more major range break above 1.0100), USDJPY (trying to break the 112.00+ range resistance), AUDUSD (the 0.7200 area) and EURGBP (0.8650-0.8700 pivot zone) and GBPUSD (1.3000 area). With a five day weekend ahead in Denmark (poor us) and three day weekend for the US and most European markets, we’ll take off our current positions and start with a clean slate next week. Anyone trading USDCHF may look for another day of upside potential, but certainly consider raising stops to avoid taking any sizable loss on a long position. (as well, an ugly set of flash April Eurozone PMIs tomorrow morning could see a significant setback for EURCHF and drive some CHF strength in crosses for a session or more. 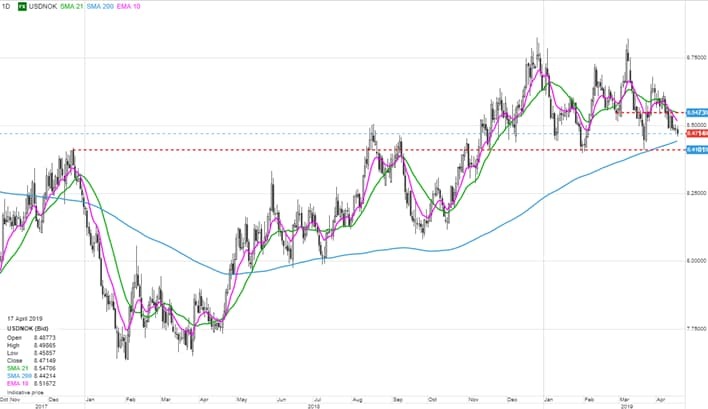 The EURNOK downside breakout has been a real disappointment, given the backdrop of market developments looked so supportive – but we haven’t fared much worse than breakeven there. Page 1: Note here that while EURUSD is perched near a 19-day high close, the range up to 1.1500 is very heavy – though a positive round of Eurozone PMIs tomorrow could spark a rally. Also note that EURGBP is poking at an upside breakout level here (arguably, the 0.8700 area is more important) and GBPUSD is doing the same. But the CHF weakness is providing a good deal of the green colouring on Page 1 here via EURCHF and USDCHF breakouts – both of those pairs are nearing resistance, especially USDCHF. AUD strength also very broad-based – interesting to see how that holds up over Australian jobs numbers tonight. Page 2: Note the important line in the sand on the USDNOK chart we discuss below as USDNOK is trading within striking distance of a major level. The strong risk sentiment in evidence for the major non-Asian EM currencies, as RUB, MXN and ZAR all poised near new highs versus the greenback. Gold is in the opposite boat as we look at in the chart below. 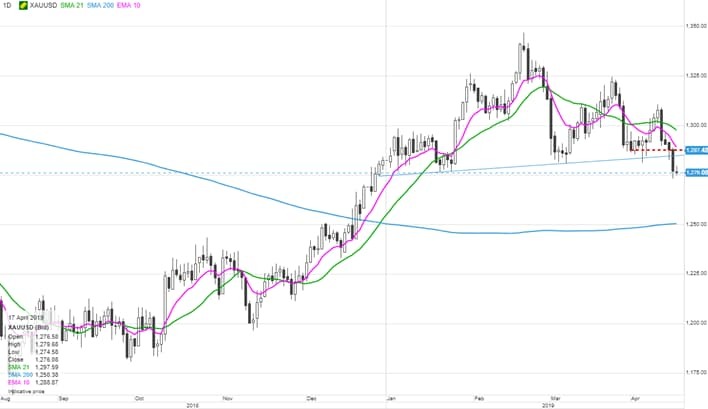 NOK traders have been frustrated by the inability of the key EURNOK pair to punch through support despite a very supportive backdrop. In the meantime, the USDNOK pair has meandered toward a very pivotal level to the downside around 8.45-40. A significant move lower likely needs positive data catalysts to drive a move in EURUSD towards 1.1500. Gold has been sliding badly of late, likely a mirror image of rising long bond yields – and the support level taken out throws down the gauntlet against the gold bulls…next important level down towards 1,250, the psychological and 200-day moving average area. The products offered by Saxo Capital Markets UK Limited ("SCML") include but are not limited to Foreign Exchange, Stock, Index and Commodity CFDs, Options and other derivative products. These products may not be suitable for all investors, as trading derivative products carries a high level of risk to your capital. It is possible to lose more than your initial investment so before deciding to trade you should ensure you understand the risks involved and seek independent advice if necessary.